In my previous articles, I have written about solutions architect exam and list of AWS certifications. AWS is the market leader in the cloud computing platform. If you are planning to switch your career to cloud computing, then AWS is the right place to start your learning process. Microsoft Azure is the only competitor for the AWS platform. We are going to see a lot of new changes to cloud computing and AWS in the year 2017. Serverless computing is the latest trend in the cloud. Amazon Lambda is an example for the serverless computing and it saves a lot of cost for the companies to move and run their code in the cloud. AWS certifications are most valuable in the market. With the current demand for cloud engineers across the companies, there is a good amount of requirements seek AWS certifications. I would continue to write in my blog about the AWS certifications and how to prepare for the certifications. If you have any questions, please write it in the comments section. In this article, we will explain you step by step process on how to effectively prepare for the AWS Certified SysOps Administrator Associate certification exam. This is the toughest exam in the associate level exam. It is a good idea to start from Developer Associate Exam if you are planning to prepare for all the associate level certifications. We will explore the best approach for studying for the SysOps Administrator Associate certification exam. One of the challenges with preparing for AWS certification is that there is no official study guide for the preparation. You have to mostly depend on the official documentation that are available with AWS website. Also, Amazon keeps adding new services frequently that also will be added to the exams. It is good enough to read the official documentation from Amazon website and practice the questions to pass the exam. This will be the first place to start your certification journey. The official website would have all the useful and important details about the certification in the central place. You have to visit the official link for the certification details. You will get all the details like blueprint, sample questions, exam information, video tutorials, etc. Keep this link bookmarked and refer whenever you have any questions about the scope of exam and list of topics that are covered in the exam. I assume that you have already created a free tier with AWS account. This will help you to use for practice the services. The exam blueprint is the official syllabus for the exam. This blueprint explains what are the concepts that are covered in the exam and breakup of the sections and marks that are expected from the each section. This should be the first document one should read for preparing for the exam. Here is the snapshot of how blueprint shows the list of topics and proportion of exam questions. This would help you lot to prepare for the exam. If you look at the below snapshot, SysOps Administrator exam has the equal amount of questions from all the topics. There are total 7 topics are covered in this exam. You can also refer the detailed chapters / contents that will be tested in the exam. If you look at the below snapshot, it clearly shows that what are the concepts that are tested in the exam. Note that SysOps exam would not check only the theoretical concepts, more number of questions will be asked in the scenario based real time questions. You should have good experience to answer those questions. This is the collection of documents that offers more in-depth information about each service. This whitepapers contains very useful information about the services. There are several whitepapers available on this page, but you will not be able to read all the documents for the exam. This page also keeps updated with latest whitepapers and reports. Based on the exam topics, you can select few whitepapers and read them. The following are the important whitepapers that are must read for the exam. Note that this list for preparing the SysOps administrator exam. Other exams will have some other recommended whitepapers. It is important to read the whitepapers multiple times to get good understanding of the concepts. It is often reported by the exam takers that most of the questions are asked from the whitepapers and that helped them to answer the questions. Note that SysOps exam would expect you to answer the more scenario based questions and deployment related questions. Once you have gone through the required study materials, FAQs and whitepapers, then it is the time to take the practice questions. AWS provides few samples questions on the website. But, that is not sufficient for the exam. You have to purchase a good quality practice questions in the market to pass the exam. Whizlabs is one of the most popular practice questions for the AWS certification exam. You can buy their 420 questions and practice well. Unfortunately, this also highlights one of the drawbacks of this kind of certification – sometimes the exams lag behind the real-world. There are some things that the AWS services now do things that aren’t reflected in the certification exam. If you don’t have the benefit of using AWS at work, create a new AWS account (i.e. using a new email address) and make the most of the free usage tier. Just set up a billing alarm to send you an email when you are in danger of being charged too much, and you can’t go to wrong. The exam will have 55 multiple choice questions with an 80 minute time limit. Most questions would be single-answer responses, but some are multiple-answer responses. The exact pass mark does change without notice, according to statistical analysis (see the FAQ). Also, you have to sign a NDA agreement before taking the exam. You are not allowed to write or talk about the exam details. It is against the policy. So, the practice questions offered by various training are based on the syllabus topics that is shared by Amazon. 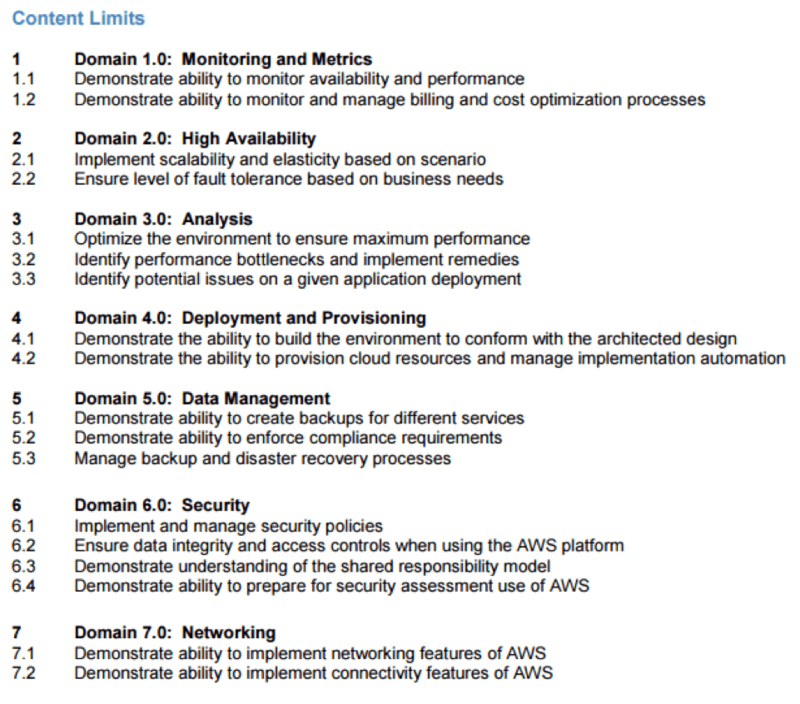 • How to prepare for AWS SysOps Administrator Associate exam? • What is the salary for an AWS certified developer? • How to prepare for Solutions Architect Associate Exam? I hope this article is very informative to understand the basic details that are required to prepare for the AWS Certified SysOps Administrator Associate certification exam. If you have any questions, please write it in the comments section. I hope this article is informative and useful for you to prepare for the AWS Certified SysOps Administrator Associate exam. I have explained the important source of information required for preparing this exam. If you have any questions, please write it in the comments section. How Can You Choose Best AWS Certification For Your Career?